Emilia Bassano. It’s a name mostly invisible from public consciousness; even literature lovers and Shakespeare geeks have been largely oblivious to her existence. Until 2018, that is, when Emilia premiered: a bold imagining of her life as a passionate woman and poet struggling against the grain of the patriarchy and advocating for the voices of women. The lack of recorded history about Emilia, and remarkable women in general, is the driving force behind the play. Records of her life are few and far between, ranging from public records, her own published book of poetry Salve Deus, and comments by astrologer Simon Forman, whose words on her were heavily biased and focused on his attempts to sleep with her. Very little is known about her, so her place in history is largely invisible - but that’s where this show, written by Morgan Lloyd Malcolm and directed by Nicole Charles, comes in. 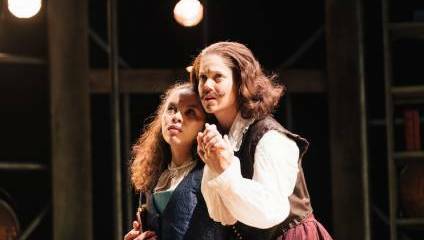 The Globe’s Artistic Director Michelle Terry and Lloyd Malcolm decided it was time that Emilia was recognised and celebrated. Lloyd Malcolm crafted a speculative tale to fill in the gaps of Bassano’s historical record, providing a beefier, energetic alternative to the scraps of information available. It’s clear that Emilia isn’t definitively historically accurate, but it doesn’t pretend to be. Lloyd Malcolm’s meshing of Shakespearean lyricism with unapologetically modern language is a flirtatious reminder that this is about women creating and telling their stories, both independently and collectively. Luisa Gerstein’s music also harmonises with this idea. Through ethereal soundscapes and spirited musical moments, Gerstein combines the acoustic melodies of string instruments and gentle vocals associated with the Elizabethan era with modern, electronic sounds, which were especially electrifying alongside flashes of physical theatre that enact powerful moments, such as Emilia and her band of river women working tirelessly to reproduce her protofeminist poetry. The music and choreography nod to the story’s place in history, but most firmly allude to its relevance to the stubborn sexism faced by women today. The play has a lot going on – multi-rolling, cross-gendered acting, song, audience interaction and more – so director Charles has a lot to grapple with. At times these theatrical devices err on the side of cliché, but Charles’ direction is consistently sharp, and the touch of cliché serves to avoid alienating audiences and instead encourages them to form a strong bond with the cast. The overarching effect is a polished and playful production, kept uncomplicated by its lack of pretention. The cast are pillars to the play, and it’s clear each one of them wholeheartedly embrace the fun, the anger, the passion and the hope that it radiates. Saffron Coomber, Adelle Leonce and Clare Perkins, who play Emilia at different ages, give fiery performances, and don’t fail to portray the nuance of an ambitious woman attempting to manoeuvre herself through a society that wishes to silence her. There is a powerful feeling of a rapport between the cast and creatives of this play, which encourages an energy so uplifting that it’s almost impossible not to feel a buzz in return. Emilia ends powerfully with a mighty monologue-come-call-to-action from Perkins, perfectly embodying the essence of the play, as she demands that we, women, are heard and that we demand to be heard, which is exactly what Emilia does.